You can convert any popular video file to iPhone supported formats such as MOV, MP4, M4V, MPEG4, etc. with help of the AnyMP4 iPhone Video Converter. Also, you can extract audios from any video and convert them to your needed audio formats such as AAC, ALAC, MP3, WAV and so forth with fast speed and excellent quality. Moreover, this program supports any version Apple device including iPhone 5C/5S, iPad 4, iPod Nano 7, iPod Touch and compatible with the latest iOS 7. Apart from that, this program provides you with some powerful editing functions, and you can trim any part of the video, crop the video frame and watermark the video at your disposal, also you are able to choose your favorite audio track and subtitle according to your needs. This iPhone Video Converter can convert any popular video like TS, MTS, M2TS, MXF, TRP, TP, QT, MPG, etc. to iPhone compatible video formats like MP4, MOV, M4V and others. And you can also use this software to extract audio from all video files and convert them to your needed audio formats such as MP3, AAC, AIFF, M4A, ALAC, WAV and more. Besides, this program supports any version Apple device including iPhone 5s/5c, iPad 4, iPod Nano 7, iPod Touch and compatible with the latest iOS 7. AnyMP4 iPhone Video Converter can help you personalize the video effect as you like. You can join multiple video files into a single file, add text or image watermark to the video, crop the video frame, cut off any part of the video to meet your needs, adjust the video effect by setting brightness, contrast, saturation, hue and volume. 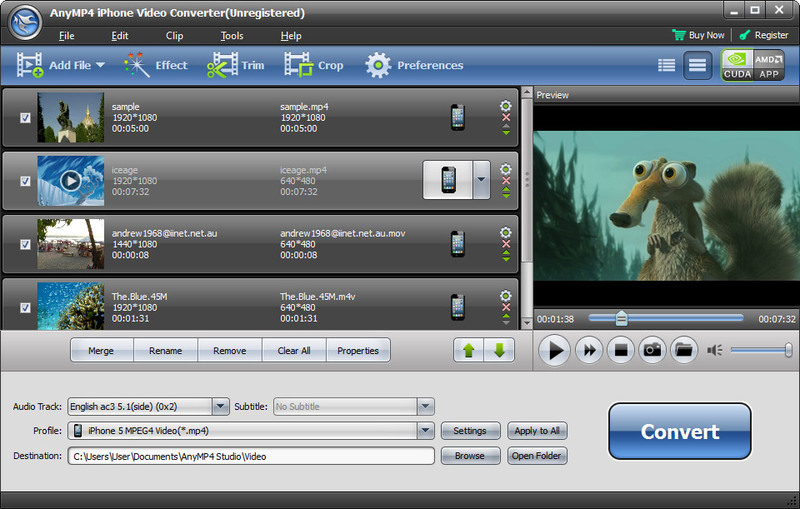 AnyMP4 iPhone Video Converter allows you to choose the audio track and subtitle for your output video. You can adjust Video Resolution, Encoder, Bitrate, Aspect Ratio, Frame Rate, as well as Audio Channels, Encoder, Bitrate and Sample Rate to perfect the video effect.